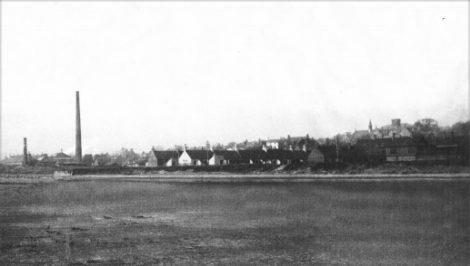 In 1841 the population in the parish of Monifieth was recorded as being 3461, this was inclusive of the inhabitants of Broughty Ferry, Drumsturdy and the surrounding country districts. In 1862 Broughty Ferry which was at that time within the parish, and still a small fishing hamlet, under the General Police Improvement (Scotland) Act, put forward an application to be considered as a Burgh. 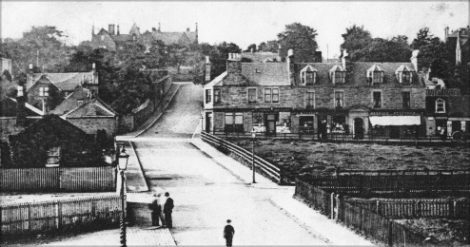 On 14th June 1863, followed by a poll, which resulted in Broughty Ferry becoming independent on the 12th February 1864. The village known as Kirkton of Monifieth had over the centuries grown into a small but busy industrial township. Iron founding, jute mills and associated trade supported many skilled workers. In 1895 in accordance with the Burgh Police (Scotland) Act 1892 Monifieth ceased to be a village and was registered as a Burgh on 11th January 1895. David Stewart being elected as the first Provost. 1. Angus Council Access Office: Before transformation for use by Angus Council / Tayside Police, the building was erected as the premises of the Dundee Trustees Savings Bank. 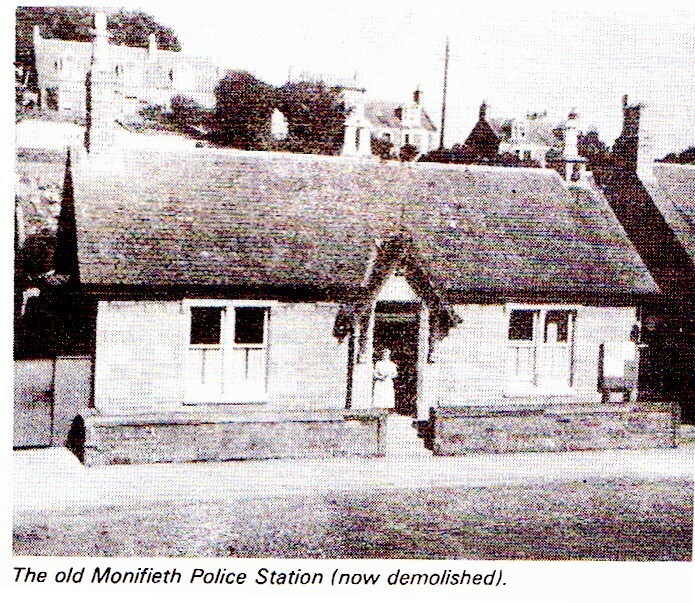 The site having previously been the location of Monifieth Burgh Police Station. 2. Italian Restaurant — formerly Royal Hotel. First established as a coaching inn. An item of interest is to be seen on the gable end of the building, in the form of a metal hook attachment. This is a relic of the days of the Monifieth Tramway Service (1905 /1931). It’s function being to assist in the “slinging over” over of the power cable, enabling the tramcar to be turned around on the rails for its return journey back to Dundee High Street. 3. Monifieth Library. Built in 1952 as the headquarters and offices of Monifieth Burgh Council. Became no longer required when Monifieth , by government legislation, became the responsibility of the Dundee Council in 1975. 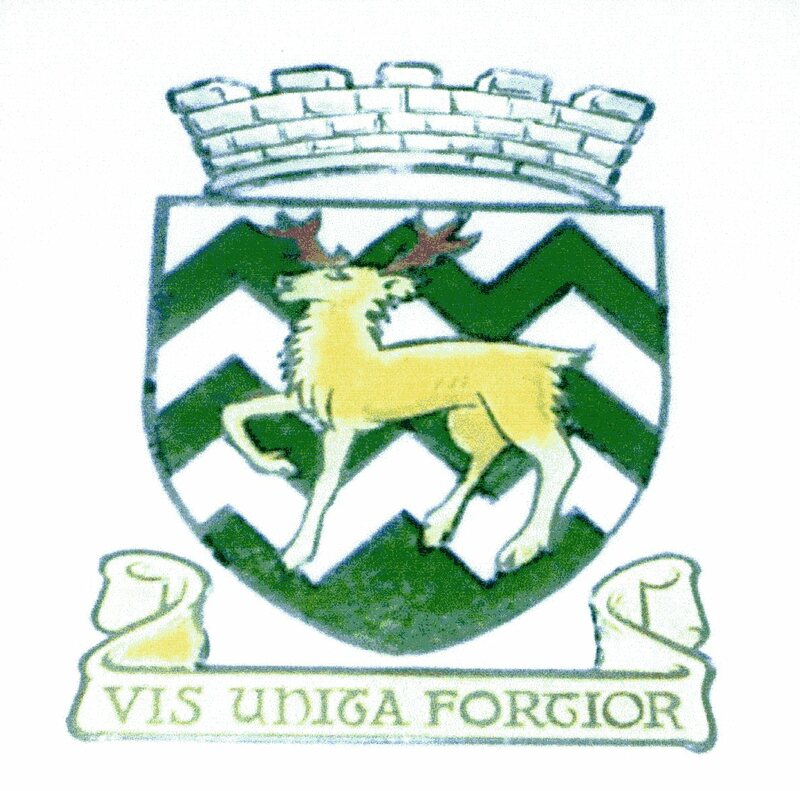 On 11th January 1895 in the Sheriff Court of Forfarshire, Monifieth was registered as a Burgh. 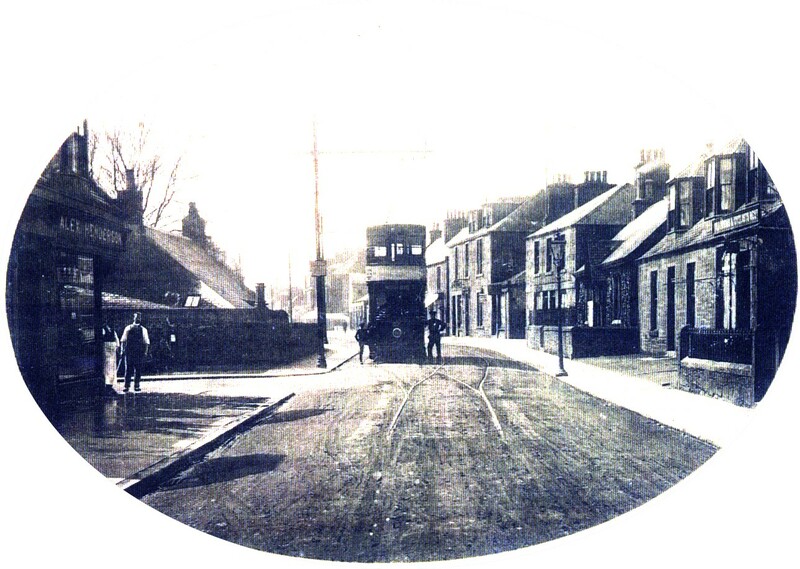 The work of the elected Monifieth Burgh Council brought many varied improvements by installing general sanitation, upgrading roads and pavements, introduction of a tramway service, building of modern housing, in fact ensuring a first class environment for the residents. 4. Tay Street / High Street Junction. Note the Victorian Post Box located in the Library boundary wall. 5. Garage: Junction of Brook Street; Formerly the business premises of “Bummy Crighton, where overnight the planes used for `flights from Monifieth links` were housed. 6. Former Dairy in Brook Street. One of several formerly within the Burgh making daily deliveries to the homes of customers. 8. Beside the Panmure Hotel, which was built on the Golf Course, is the railway underpass. To the left is now the `running track. 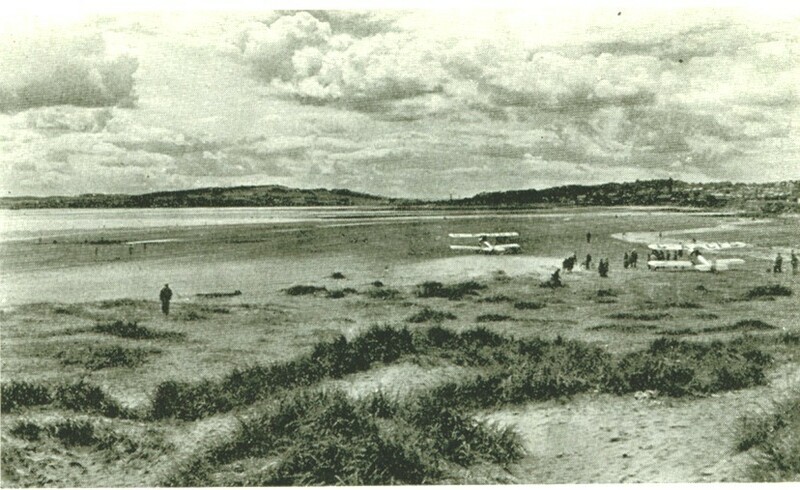 In the late 1930`s this was a large sand dune known locally as “Hill 60”. It was used for filling sand bags at the start of World War 11. This picture clearly indicates the location of the former Monifieth Gas Works, Albert & Windsor Terraces, Albert Works, (Low & Duff`s Foundry) Now the site of the Blue Seaway play area and the Tayview Caravan Park. 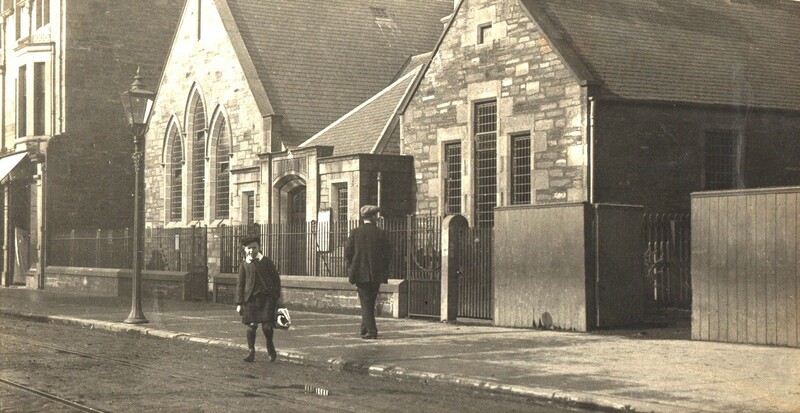 Monifieth Gas Works was built under the instruction of the Monifieth Burgh Council to provide services for the local residents as a means of lighting and cooking, also the provision of Street lighting. Prior to the formation of the Monifieth Burgh Council there had been a limited supply of gas produced and supplied by the Foundry of James F Low & Co. In 1902 the Beath family took over the vacant premises of the Lyell brothers , who from 1873 had operated a spinning / weaving mill in what was later to be known as the Albert Works. Housing had been provided for the predominantly Irish immigrant workers, which were known locally as `The Bricklands` This accommodation was replaced in 1902 by Low & Duff by the building of desirable houses, with tiled fireplaces, inside toilets, gardens to the front and back of the buildings. They were name Albert & Windsor Terraces. Albert Works (Low & Duff) office block, cooling pounds. 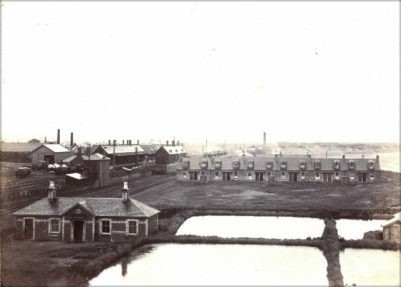 Gate house & cooling ponds of Low & Duff, Brass Founders, also showing Windsor Terrace, Monifieth Railway Station, Signal box, Waiting Rooms and Goods shed. Behind Windsor Terrace the chimney stack of Monifieth Burgh Gas Works. Platforms & Waiting Rooms which were removed and now at Boness Rail Museum. Also the Booking Office accessed from South Union Street. The Dundee Arbroath Railway was opened on 6th October 1838. It was one of the first in Scotland and said to be the reason for the awakening of a `sleepy rural village` into an industrial centre. In 1841 the population of Monifieth was 400 persons. Within 50 years this had rapidly increased by another 3000. The first locomotive used on the line was named `Wallace`. On the front was a relief casting of the Braveheart Scottish warrior. The engine was built at the Wallace Foundry in Dundee . Let us believe that both shared the honour. Special trains were run in 1839 from Dundee to the popular Monifieth Races, with the fares being charged at the normal rate of single journey 1st class, one shilling, second class, nine pence, third class six pence. The Caledonian Railway in 1870 opened a branch line from Dundee to Forfar This was known as the Forfar Direct Railway , which branched from the Arbroath line at Broughty Ferry, then passed through Barnhill, towards Kingennie and Monikie before reaching it`s destination. In 1880 the line was taken over by two companies Caledonian & North British Railways. 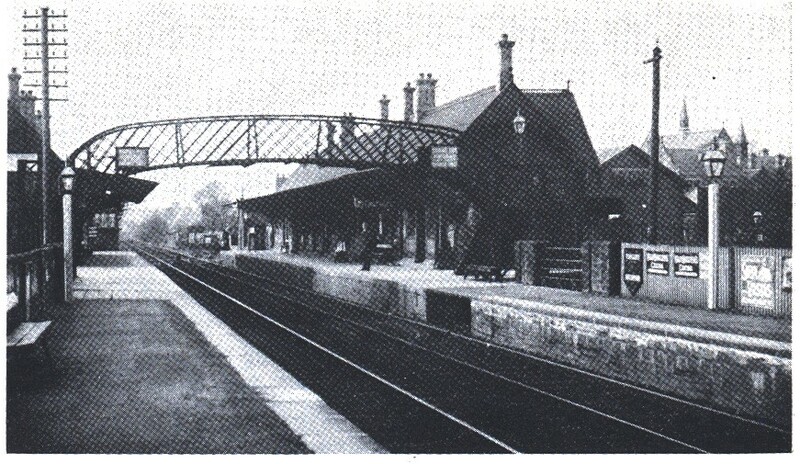 The `Dr Beeching Cuts` brought about the end of many local services and stations including Monifieth. The open field area property of James F Low & Co. Ltd. Ironfounders. 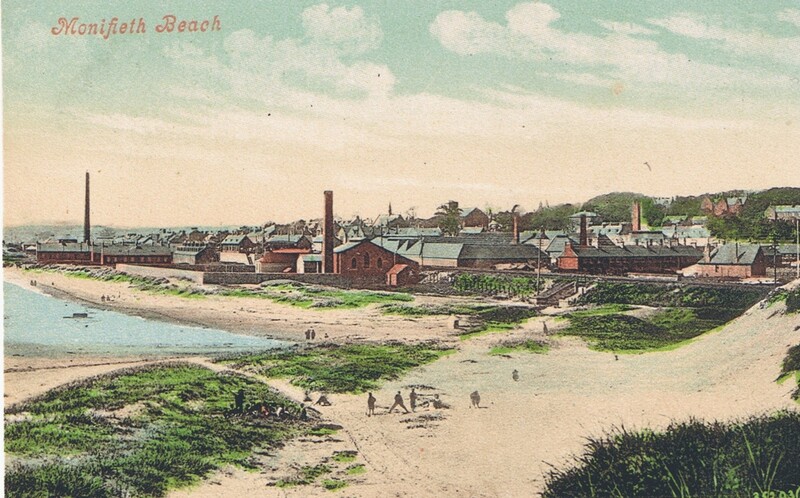 Monifieth Foundry by the Sea was established, in an open field on what later became the High Street, in 1801 by William Low . The firm became internationally known for the production of machinery used in the weaving industry. At one time exporting to over twenty seven countries and employing approximately 2000 . The Monifieth manufacturing premises covering fifteen acres in the centre of the town. Part of the site is now the location of Tesco supermarket. The Low family residence Seaview House mid centre of the picture. According to the Parish Church Records the first school master was appointed in Monifieth on the 18th November 1599. The old sand stone school house was demolished in 1879 for the erection of the building we see today. 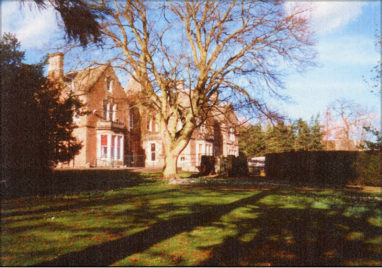 In 1928 the Seaview School annex was established to accommodate the increased numbers of pupils within the local area. 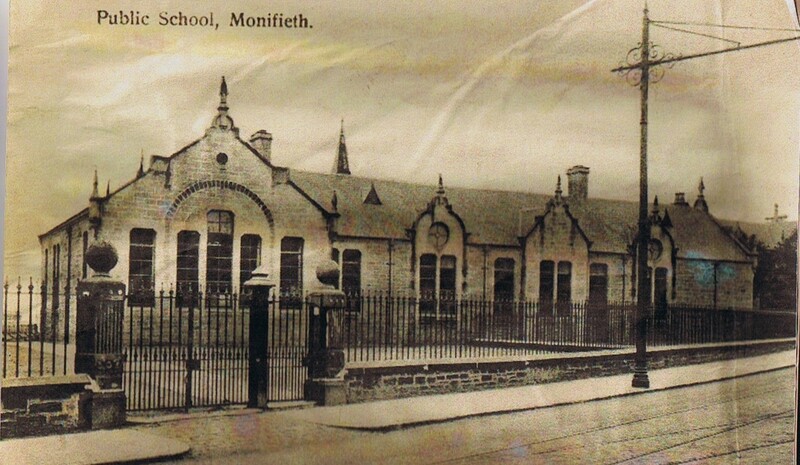 Monifieth Public School offered education for primary and secondary pupils until 1966 when government education policy decreed it could only be used for primary education. It was at that time named Invertay Primary School. Now the part of Angus Council Finance Dept., it is known as Invertay House. Opposite the Gerard Hall and Church Street is Mill Lane, which was the route taken via a `level crossing` to the Albert Works, by the employees of the Lyall brothers and Low & Duff, also the residents of Albert & Windsor Terraces . The access was `blocked off` in the late 1970`s. Junction of Maule Street / Albert Street. Formerly known as West March. Access to the West End Links is made by the bridge over the railway line. 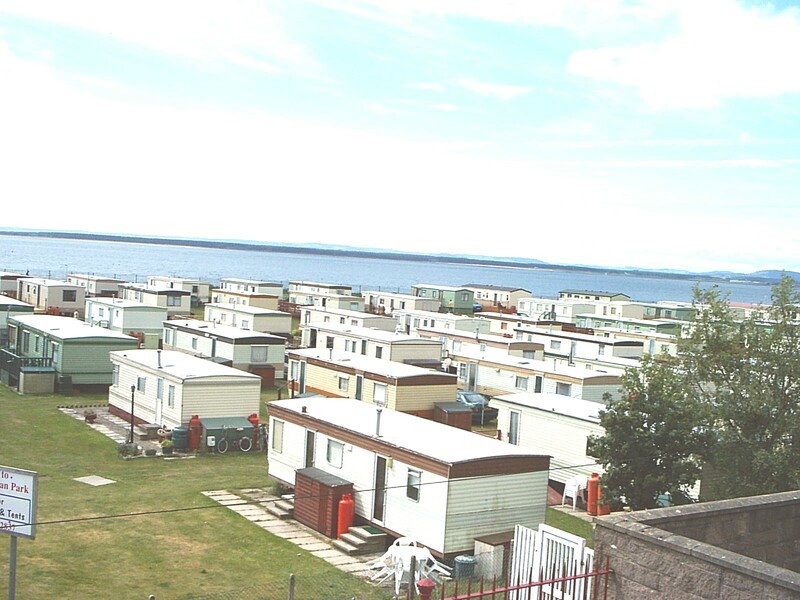 The Links were purchased by Monifieth Burgh Council 1903, to meet the leisure pursuits of the residents. In 1905 the level crossing which had existed for many years was replaced by a metal bridge. The cost of this safe crossing being £250 to the Burgh Council , with the rail company meeting any extra charges. The park was furnished with a chute, swings, maypole and a putting green. Many events were held on the links. The celebration of the Jubilee of King George V & Queen Mary etc. Many from out with Monifieth enjoyed having their Sunday School picnics in the park. A Boys Brigade group camped there on an annual basis for many years. Erected in 1922 after what was believed to be `the war to end all wars`, it was unveiled by the Earl of Strathmore. The bronze figure sculpted by Herman Cawthro, of London enhances the stone Cenotaph designed by Charles G Soutar. For numerous years past the floral displays being Prize winners in the Annual National competitions entered by the Monifieth Branch of the Royal British Legion. One of several Sanctuary Crosses to be found on the wall in Maule Street. 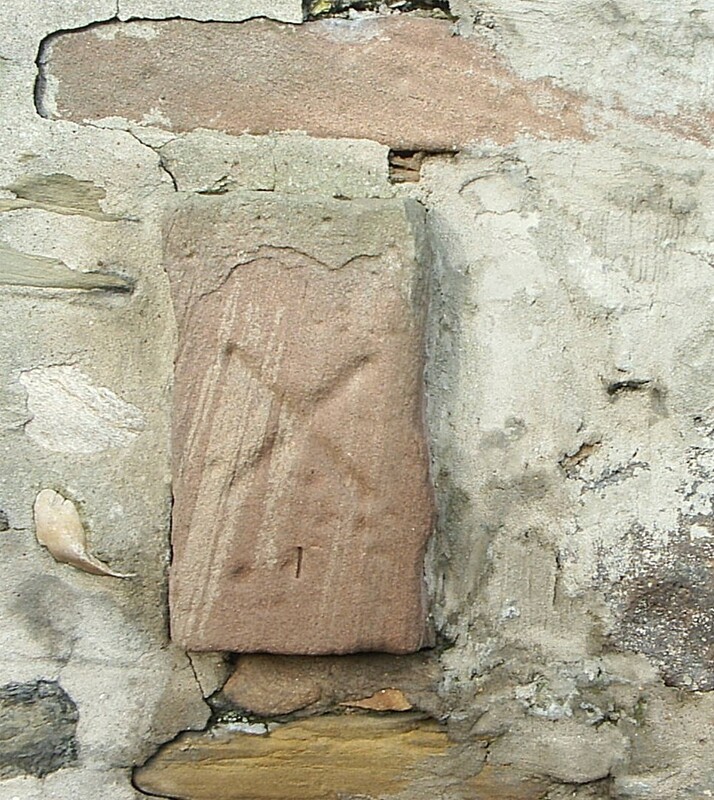 These crosses once marked the Abthein of Munifeit which c1202 Malcolm, Earl of Angus granted to Nicholas, son of Bryce, priest of Kerimure the heritage of the whole land of the Abthein of Munifeit.The boundaries of the Celtic Church, were where within sanctuary could be found by those in need. 14. Ashbank, the name derived from a tree which grew within the policies. Standing on a hillock to the north of the present Victorian Villa, it overshadowed the Parish Church steeple. Kirk session records show that in 1690 trees were planted around the Kirk, and this was one which reached a height of around eighty feet. A well known landmark to sailors , when entering Monifieth bay. It was removed in 1897 and the site is now built upon. The owner of Ashbank in 1864 approached Mr Cosmo Innes, Dr David Robertson and Dr John Stuart, who were examining ancient stones found when demolishing the pre reformation Church , to examine a stone he found when digging a well in his garden. This proved to be a shaft of a free standing cross decorated in Celtic style, with figures said to represent the Saviour with St John and Mary, Ecclesiastics, men with hand held horns and a figure which was said to be King David playing a harp. Known to all in Monifieth as a centre of learning, dancing ,playgroups, in fact over many years a meeting place for the community. In 1880 in recognition of his 25 years untiring work , within the community. Rev. Dr. James Gerard Young was presented with a silver plate and £100. The money was returned by him as a donation towards a building fund for a Sunday School. In 1882 at a cost of £2000 it was built and opened completely debt free. Under one of the pillars within the hall was buried a `time capsule` . Included in the items was a statement in Latin, the last phrase translated reads as follows “ A monument, which neither wasting, shower, nor furious north winds will destroy”. Reputedly a place of Christian worship prior to 574 AD, when records show there was an established church on this site. St Rules derived from the St Andrew story. The Culdee`s were established near this site and were not disbanded until 1242. As a `mother` church with several subsidiary chapels. Eglismonichty, on the north bank of the Dichty, ( St Andrew relics connection) . One dedicated to the Blessed Virgin Mary which stood on an island in the river Tay on what is now known as the Ladybank sands.This island was said to be the site of the shipwreck of David , Earl of Huntingdon. Chapel Dockie which was located at Ethiebeaton. 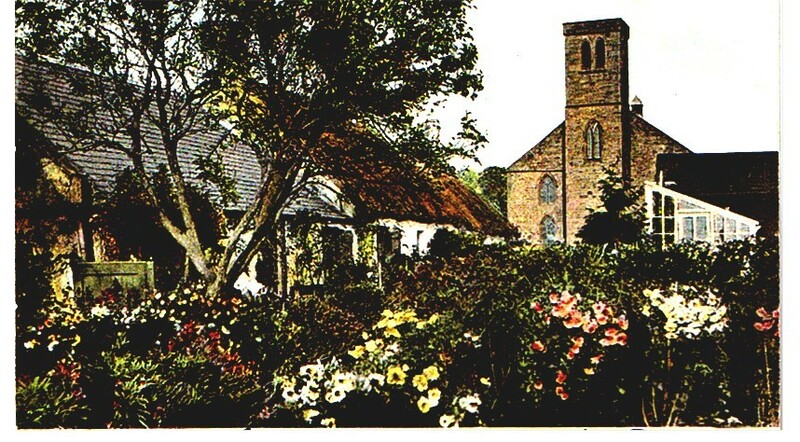 Chapel Brochty, in east Ferry where the burial ground can still be visited. Barnhill Chapel , later St Margaret` Barnhill , originally under the jurisdiction of Monifieth Parish Church. The present building replaces an older pre Reformation Church which was demolished to make way for present church built in 1813 and designed by Samuel Bell (Architect) Dundee, and Alexander Thomson (Mason) Dundee. Inside are wonderful stained glass windows , which include the 1939/1945 War memorial by John M Aitken. 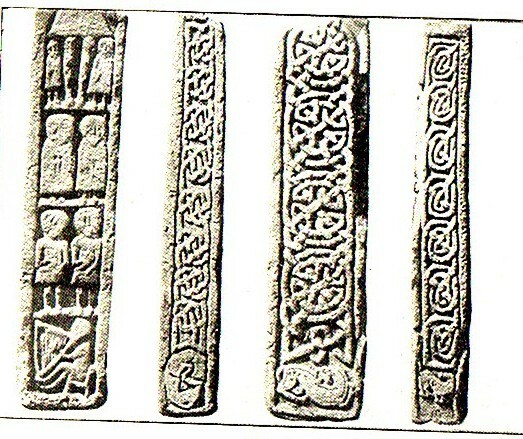 Several Celtic /Pictish stones were recovered from the demolition of the church and during the refurbishment programme. The Monifieth Cross being one of particular interest. The stones can be seen in the National Museum of Scotland, Edinburgh. It was in it`s day the local Ale house. Kirk session records reveal that although Sabbath drinking was banned from the pulpit, it was far from being unusual. A minute from the Session reads ”The minister preached both sermons.The elders searched `changing houses` non found drinking there” From disciplinary records several references are made to elders, the beadle and women being ordered to appear in sack cloth before the congregation to be rebuked for Sabbath drunkenness. The attraction of Jenny Barrie`s `front room` and the few yards separating it from the long sermons could have been overpowering. The end of summer bull sales were recorded as having taken place in Jenny`s hostelry. Celebrations held there could be without limit of time. It had been noted that jollifications could last from the time a sloop left the bay for Newcastle, then returned with another cargo for unloading. In 1869 application was made for a `preaching station` in Monifieth. This followed the break away group forming the congregation of the Monifieth North Kirk, at the Hillocks, Kingennie. In 1872 for £1000 and free manual labour by the congregation the South Church was built. A wooden bell tower housing a bell purchased for £3 from a shipyard was blown down in a severe gale. In 1884 the present magnificent stone tower was built, also a gallery was installed in the main building. The Manse, in Queen Street, was built in 1874. Seaview House was the home of the Low family who were mainly responsible for the industrialisation of the Burgh. The Monifieth Foundry of James F Low being recognised world wide. 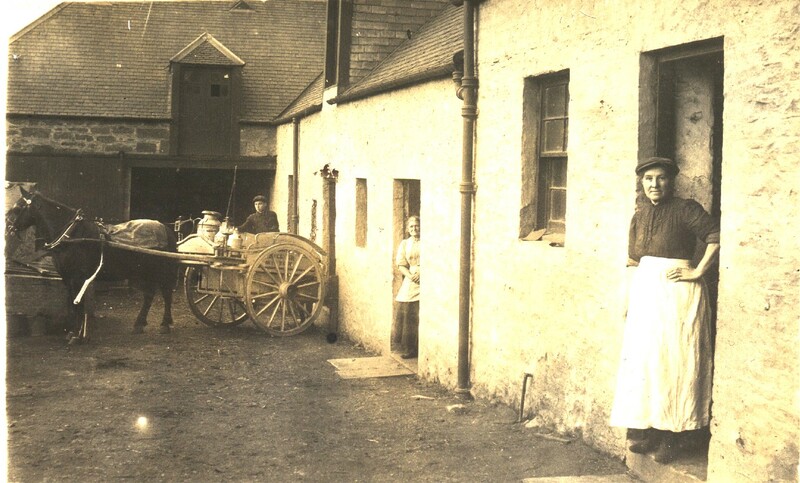 Prior to 1856 it also `housed` the engineering apprentices sent by mill owners to Monifieth to obtain the best possible training prior to becoming responsible for the management of their own businesses. At one time there were 37 indoor and outdoor staff at Seaview , to care for the family `s needs. Other Low family homes were Tighnamurin, Ashlea. In 1928 the mansion was purchased by the Education Board and used as a school annex for Monifieth Public School. 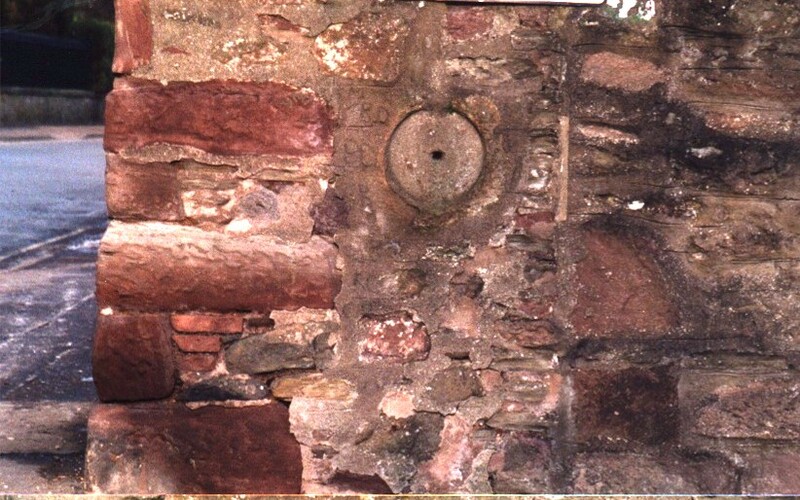 Roman Quern Stone built into the wall at the Hill Street , North Union Street Junction. This was discovered when the workmen of John B Hay (Joiners & Builders) were digging the foundations for the Victorian Villas in Hay Avenue. Other pieces of glass etc were also uncovered , which gave indications of an early settlement in the area. Part of the Glebe. Records reveal that an early settlement existed North of the Church. Barrie`s Brae was probably the name of the path, prior to the formation of Streets in 1896. David Barrie a pendicler, or type of crofter who ran a shop from his house Springbank, on the Back Road, now Hill Street, opened the first Post Office there. After a few years the business was moved to other premises acquired by Mr Barrie at the corner of Union Street and Maule Street. Hence Barrie`s Brae. Close inspection of the sculpted ornate stonework above the door identifies the building as being the South Church Halls. It is obvious there has been alterations made. 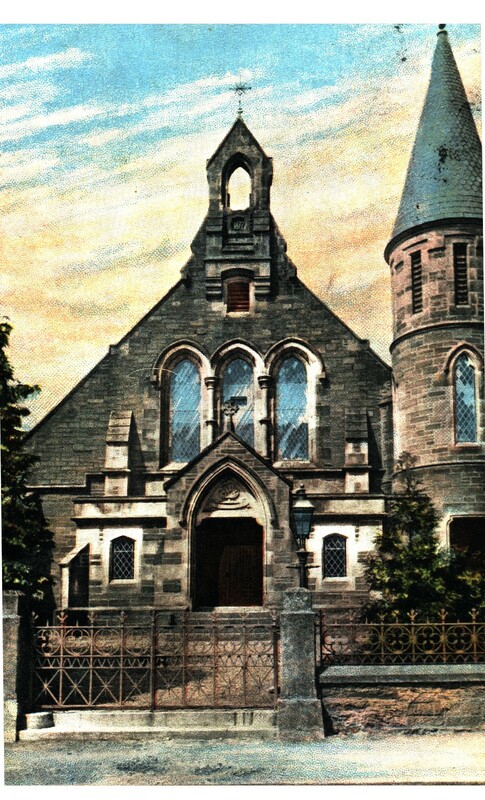 At one time it was the United Free Church of Monifieth. 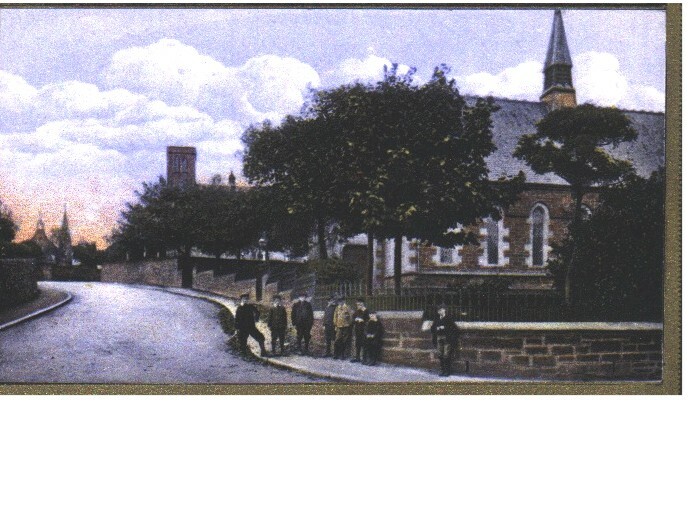 In 1869 permission was granted , after 25 years of walking to the Hillocks Church at Kingennie, that a preaching station could be approved in Monifieth. The Free Church built in 1858 was chosen as the place where the services would be conducted. In 1872 the South Church in Hill Street was built, leaving the High Street building to be used as Hall accommodation. 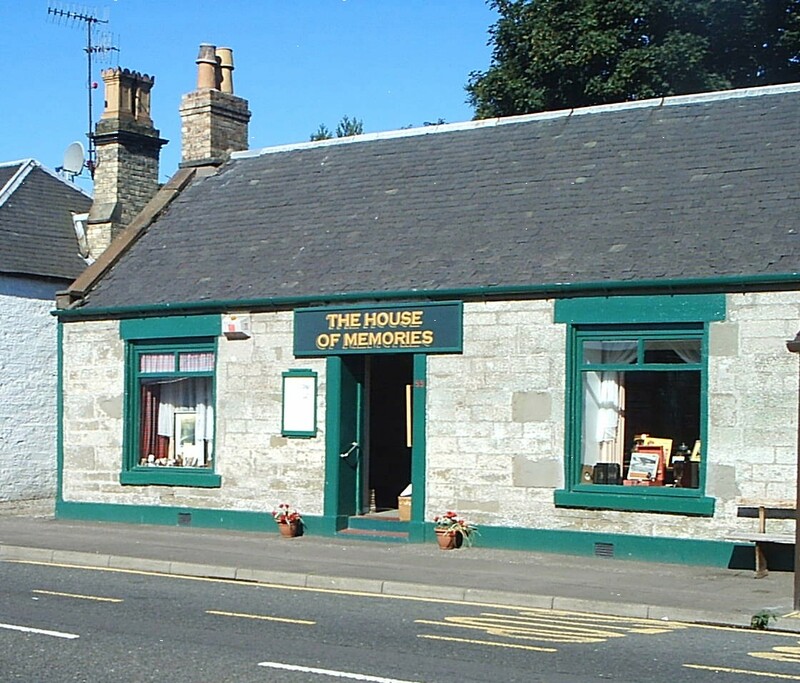 Monifieth`s House of Memories established and opened April 2004 by the members of Monifieth Local History Society. Open daily free of charge to the public, the facility is managed and financed by volunteer members fund raising events and donations by members of the community. The award winning project is supported by Angus Council. The groups main objective, to promote the heritage of the local area, is enhanced by the permanent display of memorabilia, artefacts and a vast archive of photographs. Researched and recorded findings are readily available either in written format or via the group website. This entry was posted in Monifieth town and tagged Dighty, Duff, Eglismonichty, James Low, Monifieth House of Memories, Seaview, St. Andrew, St. Bride's, St.Rule, Wm. Low. Bookmark the permalink.